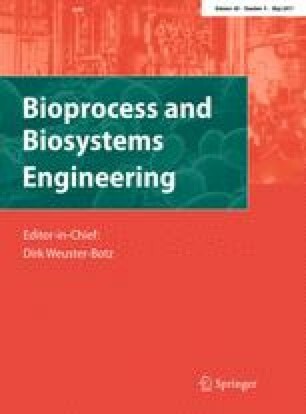 Extended cultivation times, rendering phototrophic bioprocess development time inefficient, resulted in the recent development of micro-photobioreactors enabling accelerated process development. However, especially for laboratory photobioreactors, only little is known concerning the influence of design on process performance. Thus, the aim of the present investigation was to evaluate the scalability of a microtiter plate-based parallelized micro-photobioreactor against a representative set of established laboratory photobioreactors. Lipid production by Chlorella vulgaris was used as a model system. During exponential growth, the microtiter plate cultures achieved maximal growth rates of ca. 1.44 ± 0.02 day−1 being in good agreement with the larger systems. Moreover, cultures in the micro-photobioreactor could be kept in the exponential phase up to the highest biomass concentrations most probably due to the beneficial light supply at this scale. Compared to the shake flask and test tube cultures, microtiter plate cultivation achieved an equivalent biomass yield, lipid content, and lipid fingerprint. In contrast, the flat-panel process resulted only in marginal productivity due to insufficient light supply. Thus, microtiter plates showed good scalability to the investigated laboratory photobioreactors as overall differences were rather small taking the differing scales into account. The online version of this article (doi: 10.1007/s00449-016-1731-5) contains supplementary material, which is available to authorized users. The authors thank the Federal Ministry for Economic Affairs and Energy on the basis of a decision by the German Bundestag for support and funding (Grant No. KF2519304CS3). We also thank Pamela Felden, Markus Jorissen, Kolja Mertens, and Carsten Müller (m2p-labs, Baesweiler, Germany) for support and cooperation within the project. This study does not include research involving human participants or animals.